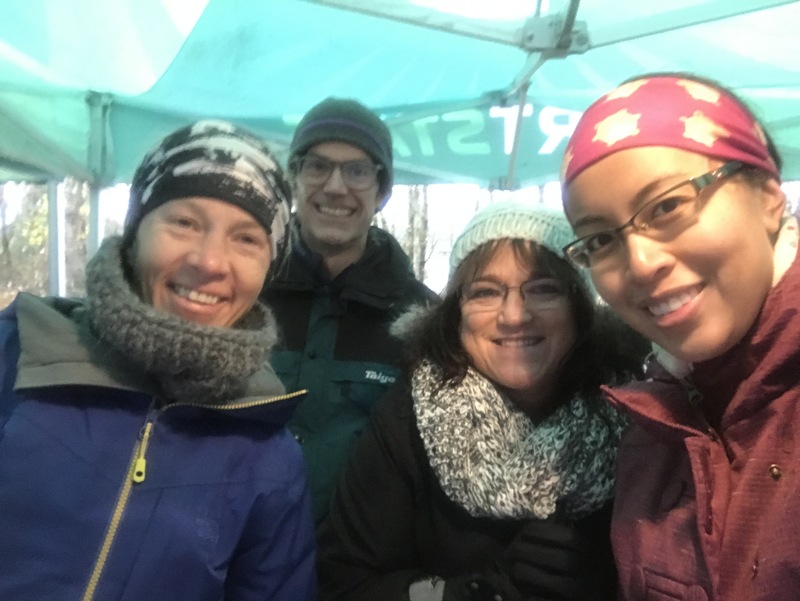 I got my first taste of the Foretrails race series last month with the Foretrails Hallow’s Eve Trail race and the Phantom Run. I ran one and volunteered for the other… and here’s how both experiences went. Cuski and I signed up for the Hallow’s Eve 10k distance, our first trail race since 5 Peaks Whistler. Yes it’s been a while, and it showed. I wanted to have fun with it so for the first time ever, I ran in costume. Here we are with Misa and Debra from the West Van Run Crew. I channeled my inner Luigi meanwhile Cuski dressed up as a… cyclist. LOL Helmet and all. A course marshal even thought he wasn’t part of the race until he asked where to go. Foretrails had prizes for the best costume and lots of runners showed their Halloween spirit. The most interesting costume: Borat in his onesie thong. I was clearly out of shape, having not run much since the Berlin Marathon a month before the race. Running on flat pavement is not the same as trails and how quickly I forgot that. It was a beautiful course but with LOTS of stairs. That was difficult and slippery at times. So slippery, I actually bailed on some steps pretty spectacularly but I was ok! Just a bruise on my arm and I continued along my way. Cuski found out and said jokingly, “do you want my helmet?” LOL I forgot about the pain after that. The scenery was pretty, as it always is on the North Shore. Lynn Creek, tall trees, sunny but cool day… it was perfect trail running weather. There were lots of wooden walkways and stairs… and more stairs. Did I mention stairs? I’d love to run this race again. It was a great first experience on a Foretrails race. It was organized well with lots of friendly volunteers. They gave away hats as swag for this race but no participation medals. That seems to be the norm for smaller trail races anyway, which is fine. I look forward to improving my time next year, if schedule permits. This year is about giving back so I volunteered for the next Foretrails race, the Phantom Run. We had to go to Seattle that day so they were able to slot me in early for Package Pickup. That was my first time working a Package Pickup and it was fun seeing all the runners come in. My volunteer group was great and chatting them up allowed me to find out about the Foretrails run clinics. I will most likely take advantage of those next year since I’ll need to train for the Squamish 50 23k which I just signed up for. We handled sign in and day of registration, as well as race downgrades. I like how flexible this race is. Each runner received a travel mug as race swag. I look forward to volunteering for another Foretrails race, the question is, which one? I saw a couple familiar faces including Milan from the West Van Run Crew, who powered through to a 3rd place overall finish. Congratulations Milan! Have you run a Foretrails race before? Which is your favourite? Let me know in the comments below.